There are a number of new restaurant openings in April, succinctly illustrated in Lifestyle Asia’s 10 New Restaurants to Visit this April. which I have been using as a guideline. Dinner at Cocotte a couple of weeks ago was an enjoyable affair with well-executed French brasserie dishes, and I have a reservation at Mott 32 next week, but it was last night’s dinner at NUR that had me rushing to the keyboard with blogging fever. Not in a while has Hong Kong seen a restaurant opening as refreshing as this one. NUR has all the elements of modernist fine dining that I love, but without all the fussiness. 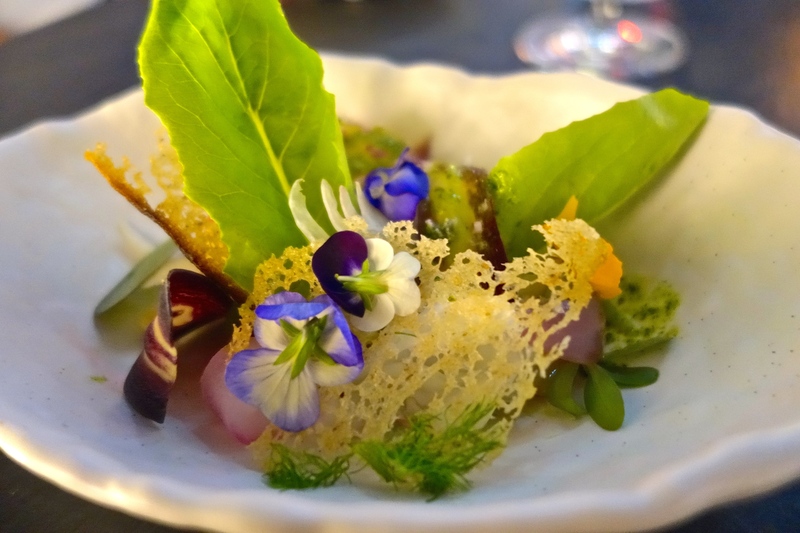 Innovative cuisine, beautiful plating (I just love the use of edible flowers), thoughtful choices on the source of ingredients and a perfectly cohesive flow of tasting courses, without having to dress up, keep your back straight and talk in hushed voices. NUR’s dining room is well-spaced out, almost too much so – they could easily fit another table in the dining room for all the eager diners waiting to get a reservation. Or maybe it’s because I’m so used to tables being packed together in small spaces in Hong Kong restaurants that I find all that space slightly unsettling – speaking like a true Hong Konger! There is a non-smoking terrace overlooking the Wellington/Lyndhurst junction, and one intimate table for four on the smoking terrace – whether or not you smoke is your choice, but you may have other guests coming out for a cheeky one. It’s a beautiful space, apart from the exhaust fans whirring overhead, which you kind of just get used to after a while. 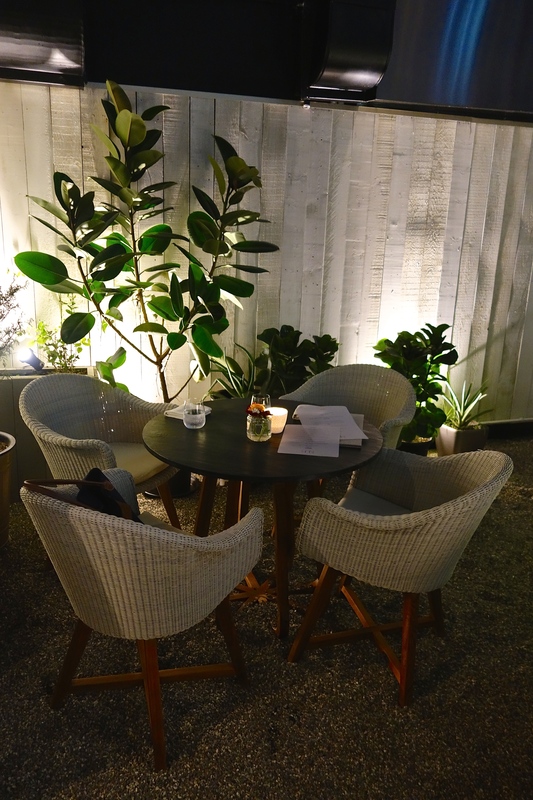 There, you are surrounded by NUR’s private garden, complete with interesting plant specimens to look at while you’re waiting for your next course. It demonstrates a physical translation of the main vision of the restaurant as well – nourishing cuisine, responsibly and locally-sourced whilst lessening the carbon footprint as much as possible. There are two choices of tasting menus, “Light” with six courses at HK$788, and “Feast” with three extra courses at HK$988. We went all out, bien sur, the reason being the tomato course which has received rave reviews but is not included on the Light menu. We started with some amuse-bouches – the beetroot taco wasn’t crisp any more when it came to the table and collapsed upon touching it, but the watercress emulsion was smooth and tasty. 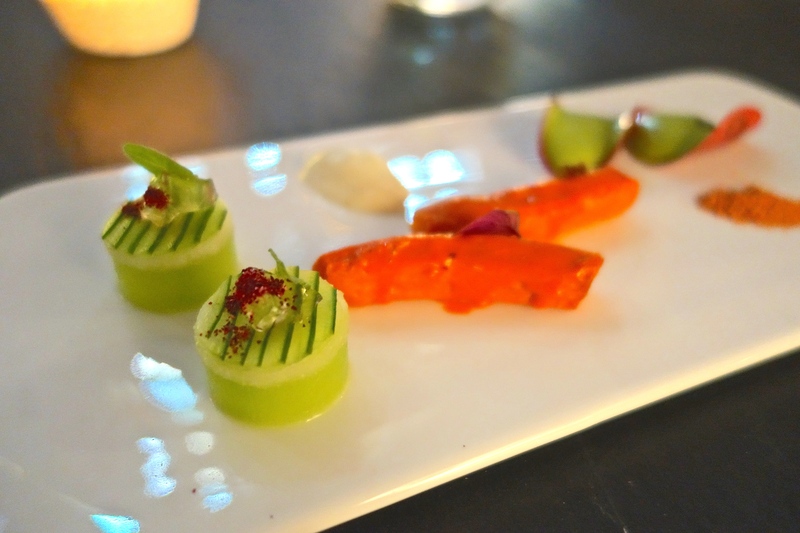 The carrots were wonderfully glazed, and the pear and cucumber morsels were very refreshing and light, with a healthy shot of jasmine kombucha. 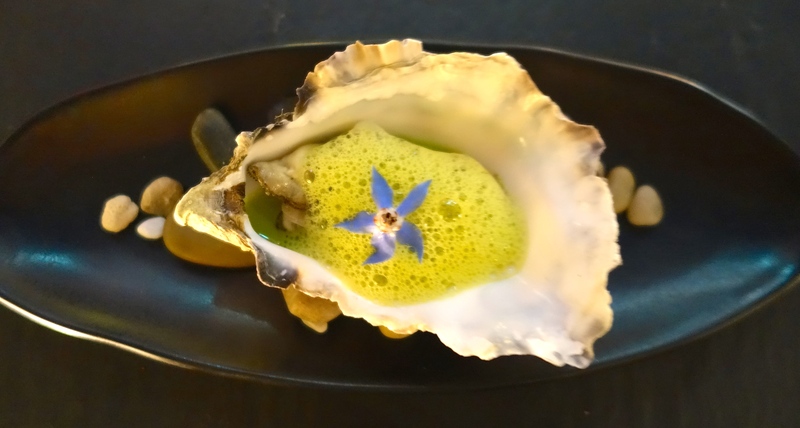 The oyster was served raw and cool with a warm cucumber and wasabi foam, which we spooned out of the shell eagerly. Believe it or not, I forgot to take a photo of the tomato course! I guess I was too excited to eat it. 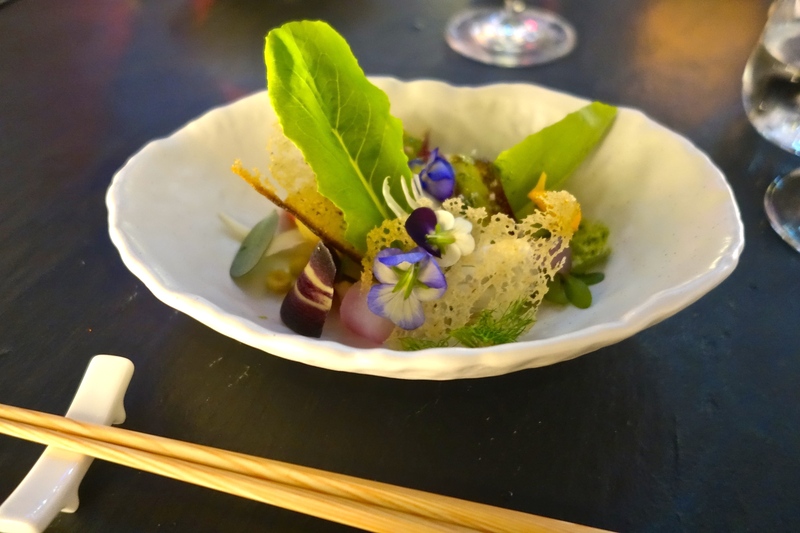 The main element of the dish is heirloom tomatoes from the Zen organic farm in Fan Ling – they were quite simply, fabulous. It has inspired us to make a trip out to the farm next weekend, which I will blog, naturally. A clear tomato broth was poured over the tomatoes at the table, warm and infused with tomato flavour, and 100% lives up to the hype. The salmon, which appeared to be cooked sous vide, literally melted in mouth. 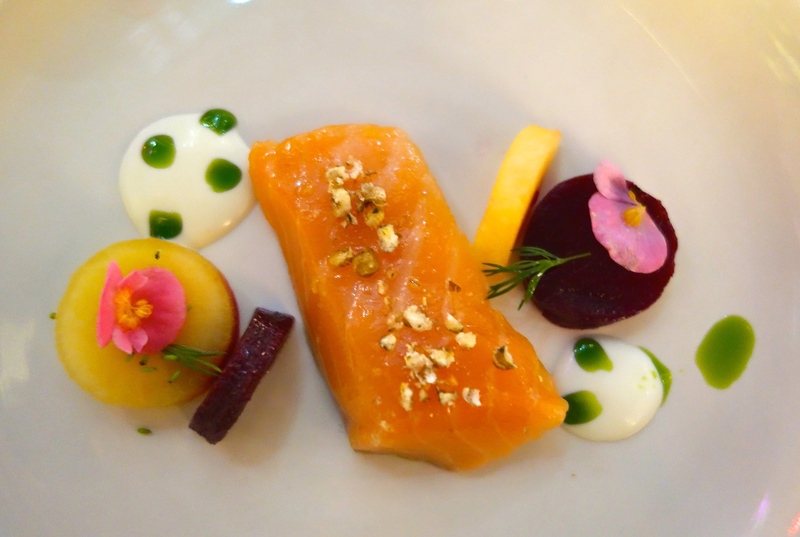 The beetroot had been marinated to create a sweet and sour element to the dish which went well with the creamy smoked buttermilk, herby dill sauce and crunchy popped grains. This dish is reminiscent of Michel Bras’ famous dish called gargouillou, hailed by some to the best vegetarian dish on earth. The 4 page recipe is certainly the most complicated one that you will ever find for a salad! The NUR version is most certainly not as complicated, but combines the basic elements of serving raw and cooked vegetables, a tasty sauce and flowers to create a complex a salad that is not only healthy but also beautiful. For an additional cuteness factor, you are given chopsticks to eat this course.